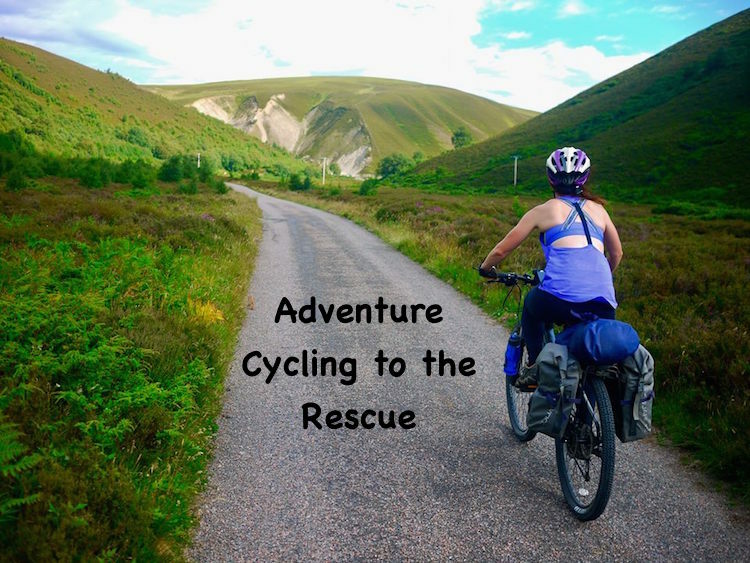 Cycle Trekkers - Adventures around the world on two wheels! Adventures around the world on two wheels! The city of Bristol in South West England, which made it into our ‘10 of the Greenest Cities in the World’ list in 2016, is fast becoming one of the friendliest bike cities in the UK. A year prior, it was given the distinction as the greenest city in the United Kingdom. New cycling initiatives, improved routes and cycling awareness are just some of the reasons why cycling in Bristol has become so popular. And, one of the reasons we now call this city, our home! 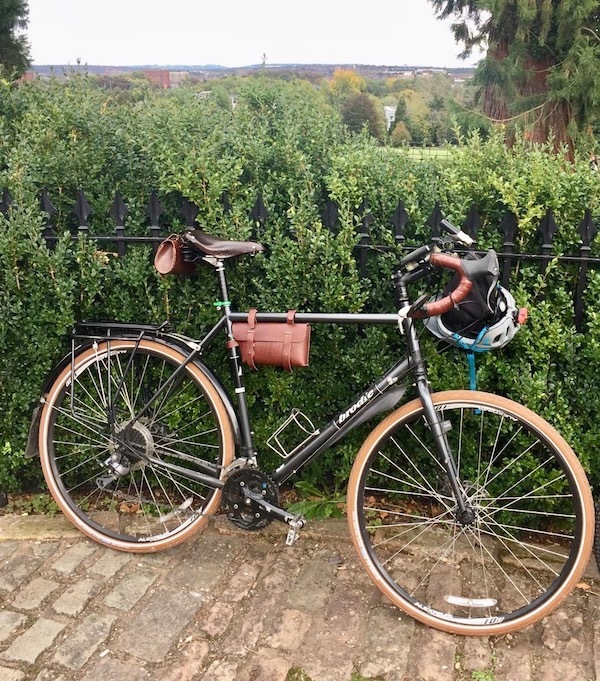 The allure of cycling in this green city isn’t the only reason Bristol is great for cycling. 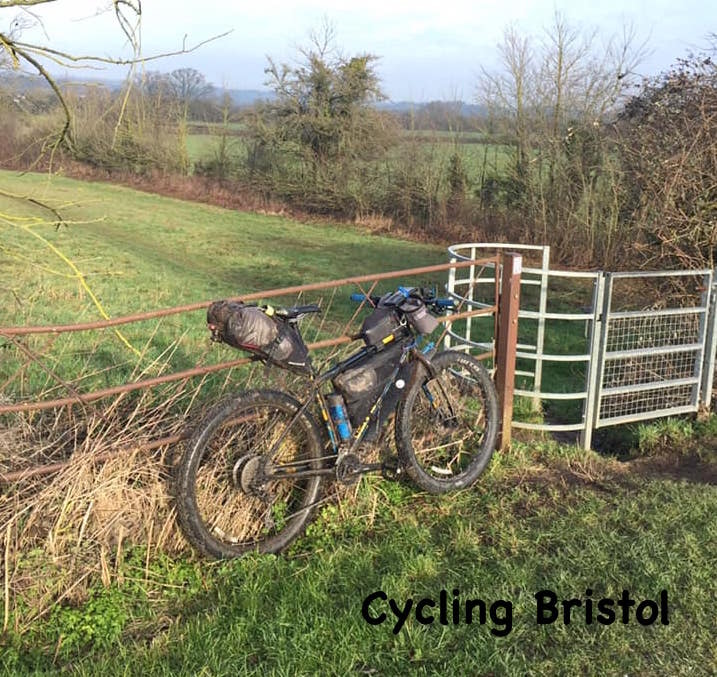 The city also boasts lovely, picturesque routes, like the Bristol-Bath Railway Path, which is the most famous of these routes, and arguably the most spectacular. It is generally flat, making it perfect for novice riders and ideal for some sightseeing along the way. I’m luck enough to live just off this bike path, and commute 20 minutes along it each day to work – much nicer than cycling on the busy city roads! 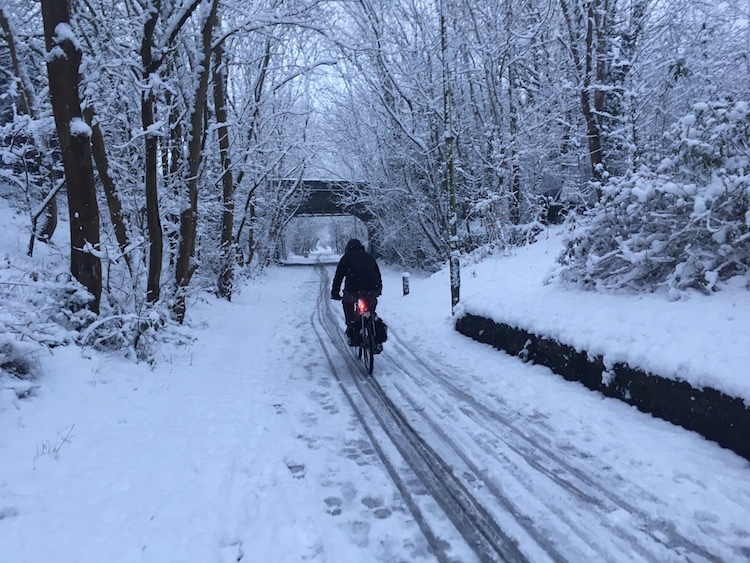 The Bristol to Bath Bike Path in snow – taken during my commute to work! Then there’s the over 15-mile Ashton to Pill Path, and it is as challenging as it is exquisite. It passes along the River Avon, with cyclists having the option to explore Leigh Woods, a vast expanse of woodland filled with rare flowers. The lesser-known Frome Greenway loop is well worth taking as well, as you’ll get to see the best of both the city (Queen Square and Castle Park most notably) and countryside (Hermitage Wood and St. Werburghs City Farm, in particular). The shorter Harbourside Loop is incredible, too, as it involves biking along Bristol’s historic harbour. Also worth taking is the Ashton Court Estate Route, which is tailor-made for mountain bikers of every level. Beginners can take Ashton Court’s popular bike trail, while experts can take the middle path, which is filled with luscious greens, and ends with a nerve-racking descent. The Strawberry Line is another popular route and passes through the divine-looking Thatcher’s Orchards. With all these bike route options, you can probably see why Michael and I chose to move here! These are but a few of the routes that make Bristol increasingly bike-friendly and you can expect most of them to improve in the coming years with Bristol Live reporting about likely renovations to the UK’s National Cycle Network. The plan to improve the 16,000-mile network, as part of a broader effort by the UK government and related stakeholders to further promote the country as a cycling destination and perhaps more importantly, to “inspire a new generation to get on their bikes.” They have the perfect advocate in this regard in Laura Kenny, who is included in Coral’s list of iconic British sportswomen since 2000. Kenny won gold medals at the London and Rio Olympics, making her one of the most successful British athletes of all time. Now, she is using her success as a platform to encourage people to saddle up. She is, in fact, an active partner in various initiatives that promote cycling, notably Soreen’s Cycle Project. Projects like Soreen’s seem to be working, as The Telegraph notes there has been an increase in the number of new cyclists in the UK. This is a great sign as cycling is one of the most popular ways of getting fit, prolonging life expectancy and saving people money in commuting. Approximately two million people cycle at least once a week in the UK, with the number of people cycling to work more than doubling between 2001 and 2011. These figures, however, don’t even include tourists who visit cities like Bristol, whose green reputation has made it a popular destination for cyclists to see the city. The Australian government is currently spending $22 million to support organisations that help older adults keep active. Why? Because staying active is a key part of having a healthy and happy retirement. The active life after the working years gets better and better, allowing you to keep active and engaged in your world and community now you’ve got time to enjoy the incredible adventures that your age offers. Now is a great time to get into cycling adventures that you didn’t have time for in your youth. The most obvious aspect of cycling adventures is that they keep you active and moving, no matter your age. Because bicycling is a low-impact sport, it’s not as hard on the knees as you might expect, either. Of course, you have to have your bike seat adjusted to the right height and have some leg strength to successfully ride your way to health. Just be sure to consult your physician first before starting any kind of exercise regimen. You can start out small with nearby cycles in neighbouring counties as you get your cycling legs back. If you’ve kept active throughout your working years, you should be able to get right out there. But even if you haven’t, cycling is safe and easy for most folks to get back into in their later years. Be sure to plan each trip based on your current riding level, and slowly add in miles while you train. Once you’ve managed a single long ride of 20 miles or more, you’re ready to tackle the region. Then you can expand out to a tour of a single country, or even an entire continent. It just depends on where you want to go. If you’re already a cycling enthusiast, you know the how-tos, but if it’s been a while, you’re probably going to want to learn some new skills to keep your bike in shape. Find some classes, watch some Youtube videos, and find other tutorials that teach you basic bicycle maintenance. You’ll want to learn how to change tyres, patch inner tubes, adjust bike seats, and oil the gears. These skills keep your brain engaged as you learn, but they also serve to keep you independent and safe on your cycling adventures. Senior centres, bike shops, and cycling clubs might all offer classes if you need a more hands-on approach to learning. When you do adventure cycling, you’ll meet folks in the groups you travel with, as well as along your adventures wherever you go. You can join a cycling club that already meets weekly or bi-monthly, or you can get some existing friends on board. You can look for cycling tour groups that do this sort of thing, or you can plan one and invite your friends and neighbours to join you. Cycling clubs are especially great for meeting new people once you’ve retired. They’re a great way to keep active, but they’re also great for helping you keep accountable in getting out there and riding, especially when you’re just not feeling it. Adventure cycling also helps to make travel more affordable for people who’ve got the time, no matter where you want to go in the world. Let’s say you’ve always wanted to travel Germany but your finances have never permitted it. 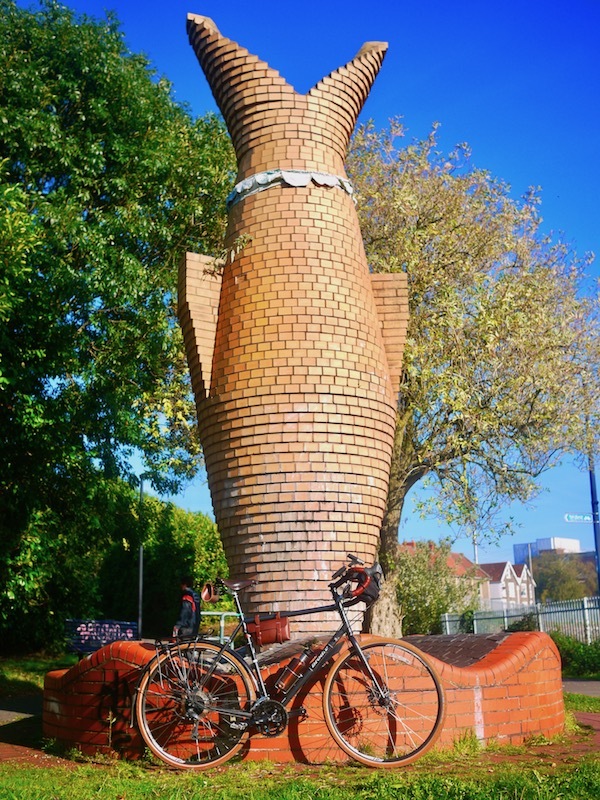 If you train at home and then grab a plane and buy a functional bike in Heidelberg, you can take off for a month of riding from place to place along the Rhine. The best part is that you really can do just about anything you want while cycling the world. That hard work you’ve done your whole life to save is now going to help you travel while keeping you active, because you can afford to take some extra time on your cycling adventures. Although cycling may not be the instant go-to form of transportation that the majority of people tend to think about when they consider trotting the globe, it certainly should be. By cycling, you don’t miss out on your journey as you’re ever-present and exposed to the elements, surroundings and adventure continuously. If you need a push to get you on your bike and around the world, here are 6 reasons you should do it. 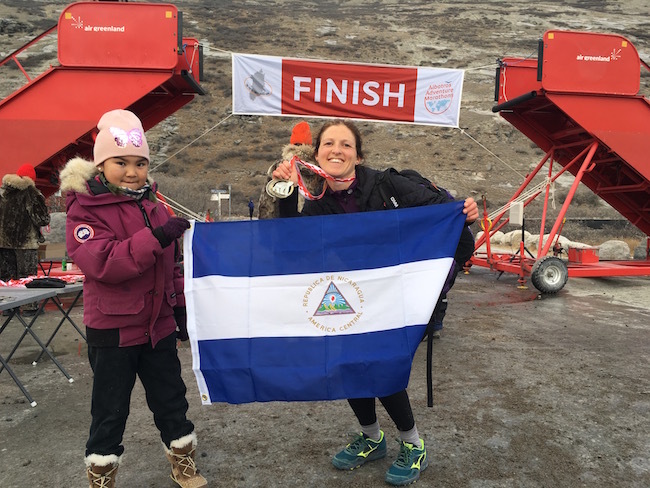 If you seek adventure and you want to help those who are less fortunate than you, you may wish to enrol on to one of the many Global Adventure Challenges to raise money for charity. Whether you want to experience South East Asia and ride from Vietnam to Cambodia or cycle across Costa Rica from the Pacific to the Caribbean, you are sure to find a journey you would live to be a part of. Apart from purchasing the bike, and maybe paying for a few repairs here and there, (some of which you can learn to do yourself before your journey), the bike is powered solely by you, thus no requirement for fuel or costly repairs in comparison to driving or flying to a set destination. Therefore, if you don’t want to spend an unnecessary amount of money on travel, your bike is the perfect pair of wheels to carry you around the globe. No matter where you cycle, be it the local shop, the next town or to another country, the health benefits are always present as you cycle. As a low impact exercise, riding your bike is kinder to your joints, it’s great cardiovascular exercise, and it also decreases your stress levels. 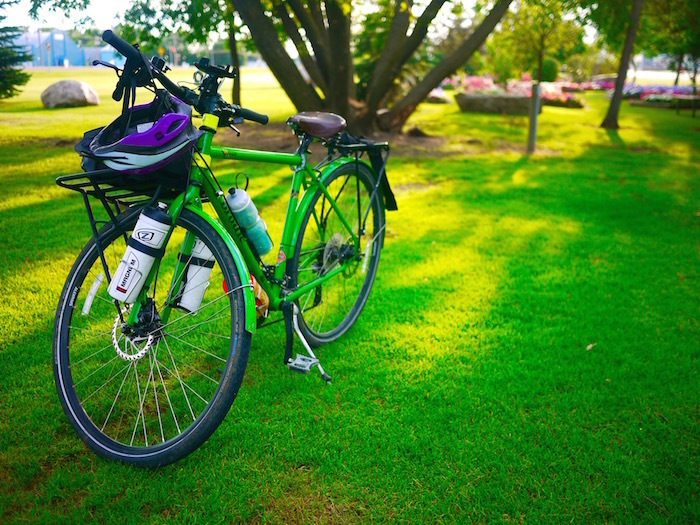 The same probably can’t be said for sitting in a car or travelling on an aeroplane, which is why you should choose your bike for travelling to reap the health benefits. If you’re conscientious about the environment, you already know the damaging affects pollution from other transport has on global warming. Protecting the planet is vital, and it starts with you. By making a choice to travel by bike, you are making a decision to reduce your carbon footprint and be kinder to the world. How many people can say that have travelled by bike from one country to another? Not very many at all. Cycling to different destinations is an exciting and different way to travel in comparison to other peoples transport options, for that you can feel a sense of accomplishment. Of course don’t forget that every path you meet whether it be mountain trails or national parks will not be smooth and without its bumps and hills, causing you to really put some effort in and push yourself from time to time to overcome a tricky route. However, once you’re over the hill, you will feel a sense of satisfaction and confidence to take on more cycling challenges. 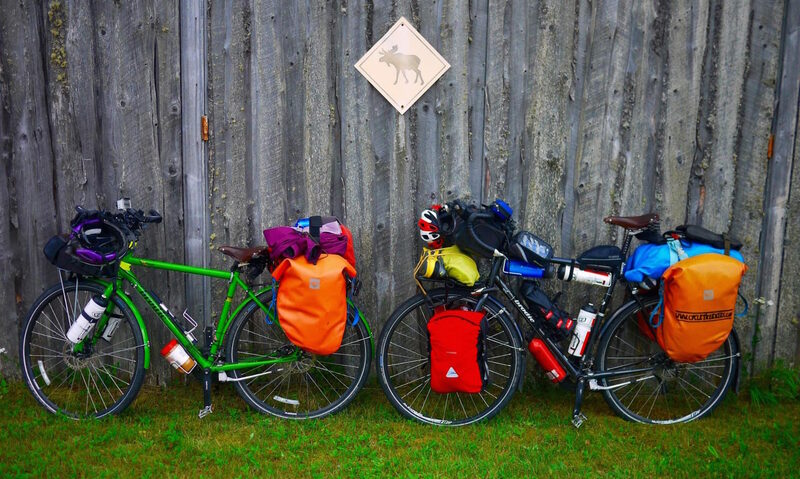 This is a list of just a few reasons why you should embark on your travels with your bike. So what are you waiting for? Would You Adopt These Bicycle Innovations? There are more than two billion bikes in use globally and by 2050, the number is expected to increase to five billion. The bicycle is an economic, comfortable, and healthy way of mobility. Industry experts are constantly rethinking how to make the bicycle more exciting and safer for the rider developing bicycles that integrate the needs of daily users. Gone are the days when innovative bicycles are reserved for the professional riders. Today, it is possible to get your hands on a bike that offers everything – performance, comfort, security, and even good looks. Whether you’re aiming to transport cargo, go off road or cycle on urban roads, this year’s trends in bicycles have something for everyone. Customized bikes, for example, offer a ride that’s tailored to your body and personal preferences. Your body is scanned to find the perfect sitting position and frame size. A software then connects you to a large data base of bicycle models that you can choose from. Incorrectly-sized bikes can cause physical discomfort such as back and wrist pain and fatigue. Plus, your chances for crashes are higher if you don’t have complete control of a bicycle because it’s too big or small for your body shape and size. Cargo bikes are also well-liked with the purpose of transporting humans and freight in a sustainable way. For example, Wike bikes are cleverly transformed from a family bike into a baby stroller. The German start-up, Muli-Cycles, offers a cargo bike that can easily hold a child or shopping basket. Safety has always been an important consideration when cycling and this year, it has even become more pronounced. For adventure lovers, gravel bikes open many possibilities. They let you discover remote areas and bike packing, short or long distances, has never been easier. Built for comfort and safety, gravel bikes are fitted with dropped handlebars, disc brakes, aerodynamics, and wider tires. Frames are variable and can be made of steel, carbon, aluminum or titanium plate with each material offering different advantages. Smart gadgets and devices also play an important role in safety. Helmets fitted with navigational devices using Bluetooth allow you to communicate with fellow riders while a smartphone app provides ongoing updates of tire pressure. A much-awaited innovation is the Norwegian TriEye glasses. This pair of glasses is equipped with a rear-view mirror like what you have in cars. There’s no need to turn your head to see traffic from behind. All you need to do is to wear the glasses and you’ll have good visibility while riding. Green bikes are making the headline not only because they are eco-friendly and reduce your carbon footprint. Electric bikes also offer something for everyone from riders on an office commute to cyclists on a racing circuit. Better handling and performance, enhanced safety, and efficiency are the main challenges of manufacturers who aim to capture a wider segment of the market. New innovations in the bicycle industry are exciting and cover a broader base of cyclists. Today’s bicycles are outfitted with better safety, performance, and high-tech features attracting different types of riders. Well I can’t believe it’s over and I actually survived. I’m not going to lie, in the week leading up to the run I was extremely nervous. My training had not really gone to plan, and even my work mate kept telling me she was concerned for my safety (yes, Cat, I’m referring to you). In all honesty, I hate the cold. I’m not sure why I keep ending up in these cold situations. First riding in snow in Canada, then the polar run/s, even the boiler in our flat just stopped working. I guess there is something about the cold I must be drawn to – perhaps the ‘not-knowing-if-I-will-survive’ feeling. I can just imagine my Dad’s response to that last comment – don’t worry Dad, as usual I won’t tell you about it until I’ve survived it. Originally I had signed up to just the full marathon. However, once I met a couple of the other runners, and discovered they were signed up to do the Polar Challenge (running both the half marathon and the full marathon), I decided I had better just sign up too. Screw the lack of training and fear of the cold! The finisher t-shirt was in my colour, so what’s it matter if I lose a couple of toes in the process? 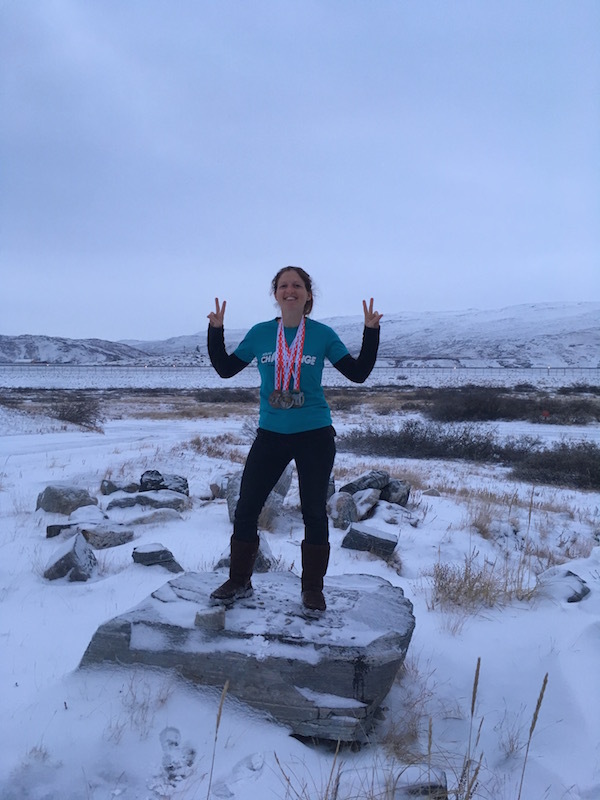 With my medals and wearing the Polar Challenge t-shirt (it doesn’t take much to convince me to do something lol). Due to some hurricane winds and wet weather the race days got moved. This is probably a good thing, seeing as on the original race day, our arctic bus (built like a bloody tank) almost slid off a bridge into some freezing water. Perhaps that story is for another day – my biggest fan (aka. my Dad) can only take so much news at once. Nonetheless, if we had the race day on the original day, there probably would have been far more injuries. I took it pretty easy in the Half Marathon. We drove an hour to the start in a freezing cold bus. I had about 5 layers on and could not feel my toes at the starting line. At this stage I thought I was going to lose a couple of toes to frost bite, before even starting the race. You don’t really need toes anyway, do you? Just extra weight. 10 minutes into the run, and I was sweating more than running in a Perth summer. I was sweating to the point that I was actually scared of running. I knew that as soon as I hit the Ice Cap I would instantly freeze. So the first 6km didn’t really go very smoothly. I was dropping things, sweating, tripping over my own feet… I ended up just walking most of it and taking photos. On the way to the Ice Cap. Then I hit the Ice Cap. Running on the Ice Cap was by far my favourite part of the run. My heavy-duty spikes were awesome! Apart from getting a bit carried away and running the complete wrong direction, it couldn’t have gone much better. I also managed not to freeze – so that was a bit of a bonus. Running on the Ice Cap! The rest of the run was amazing. 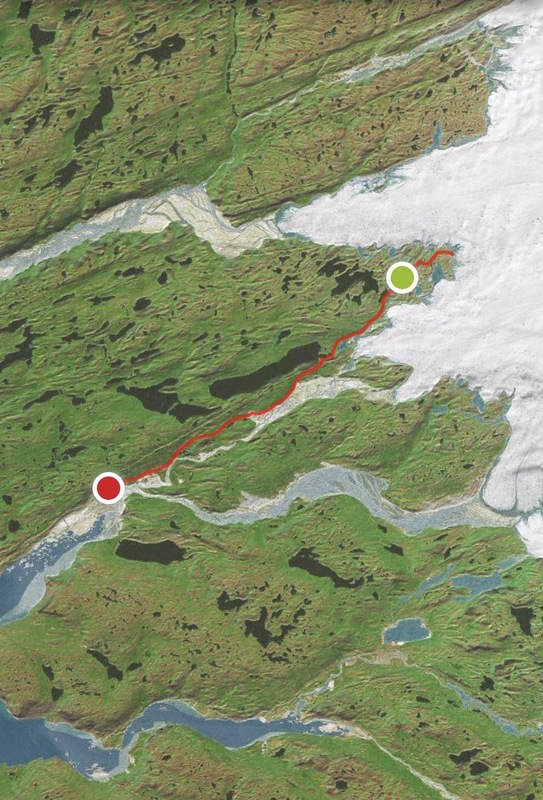 The course went past several frozen lakes and glaciers, and over several step gravelly hills. Eventually I finished the half as a PW (personal worst) time, however I really enjoyed it and was much more prepared for the full. 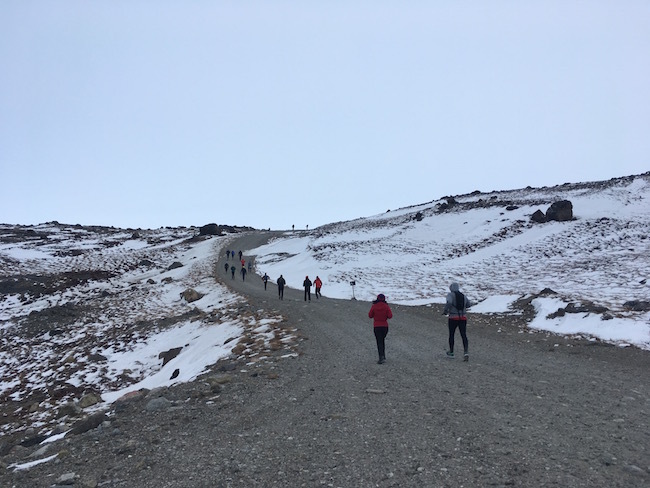 I’m now feeling conscious that I have never wrote about a run before, and this may turn out to be the longest and most boring blog post I’ve ever written… So I’m going to summarise the rest of my time in Greenland in bullet point form. Greenland: icy, cold winds, lots of meat (unfortunately for me), lots of emptiness, dancing Northern Lights, the smallest cities in the world, bloody expensive beers (though there are two craft breweries – hooray). Marathons: amazing, cold (though I still managed to sweat buckets), hilly, icy, quiet. Runners: probably my favourite part of the run and the whole trip was the runners. This was the first run(s) where I never listened to any music, and spent half of the time chatting to other runners. There may have only been 120+ of us, but I felt less alone than the ‘40,000+ runners’ events I’ve done. Such an inspiring bunch that have given me plenty of ideas for future challenges. At the finish line of the Polar Marathon! When an event has constantly been on your mind for what seems like forever, it’s an odd feeling when it’s suddenly over and done with. There is a mixture of relief, happiness… and emptiness. Since the France to China by bike fundraiser, I hadn’t planned to take part in another event fundraiser (mainly to save my friends and family from the constant spamming of requests for donations). Michael and I visited the hotel and school last year while cycling through the country, so I already had admiration for the project. I was also fortunate enough to witness the positive impact the school had had on the children, the local community and the environment. 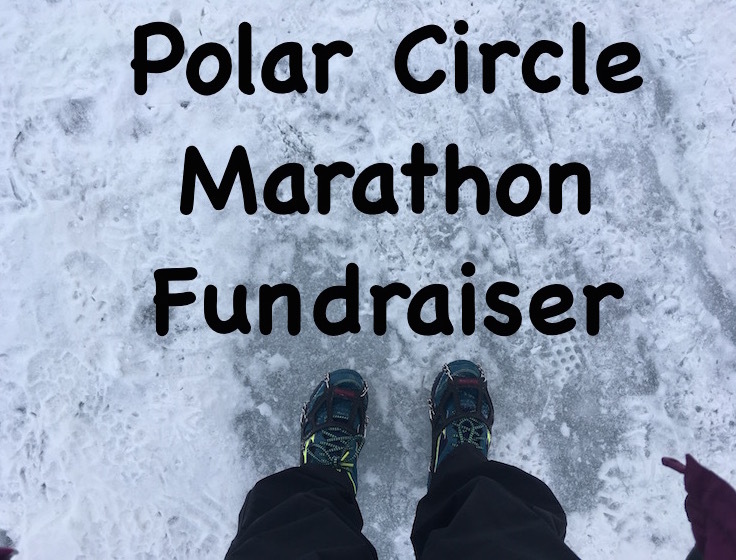 I decided the Polar Marathon was a good opportunity to fundraise for the school. All donations will be going directly to the school (minus the site’s fundraising fees) and you can visit the donation page here. I’ve discovered the site doesn’t work on all browsers (including Explorer), however it does work on Chrome and Safari. If you are having any issues making a donation, please get in touch. 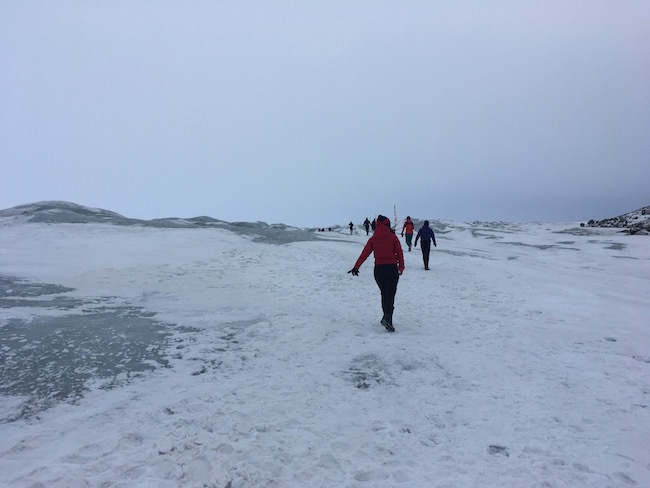 The Polar Marathon fundraising campaign is open until the end of November 2018, however you are still able to donate after this date, if you wish. The children also sent me this cute video, which I thought I would include in the post. Muchas gracias los ninos! Nicaragua is involved in a difficult political crisis with government corruption resulting in extreme poverty for the hardworking people of Nicaragua. Countries have issued travel warnings advising people not to visit the country. This is having a drastic impact on a country whose economy relies heavily on tourism. The hotel, Hacienda Merida has dedicated it´s profits during the past 10 years to educating the children of Nicaragua, conserving our natural environment, and developing effective solutions to decrease poverty and food insecurity. Unfortunately the hotel is no longer receiving any visitors, income or any profits for the school. The school and the children are at risk are sadly at risk. An independent National survey publish by the International Foundation for the Global Economic Challenge (FIDEG in Spanish) found that in 2017, 41.2% of the Nicaraguan people are living at the poverty rate of $2.33 U.S. dollars per day, with an additional 7.7% in extreme poverty earning only $1.15 per day. In addition, because of political mismanagement, many Nicaraguan’s have limited access to food and other goods, services, and health care. As the purchasing power of the average Nicaraguan continues to drop, the number of people in poverty increases. The current projections for 2018 indicate that by the end of this year, 57.3% of Nicaraguans will be in poverty. The current crisis is taking an especially high toll on the beautiful children of Nicaragua. In rural areas, children have very limited access to education resulting in high rates of illiteracy. 21.8% of Nicaraguan rural children over the age of 10 are illiterate. Any help is greatly appreciated – We all live in this world together and share the same planet. Political instability, poverty, and food insecurity do not recognize borders and have the potential to harm all of us. Looks great if you have a brooks saddle! Large enough to fit tools, tubes, plus most importantly…snacks! 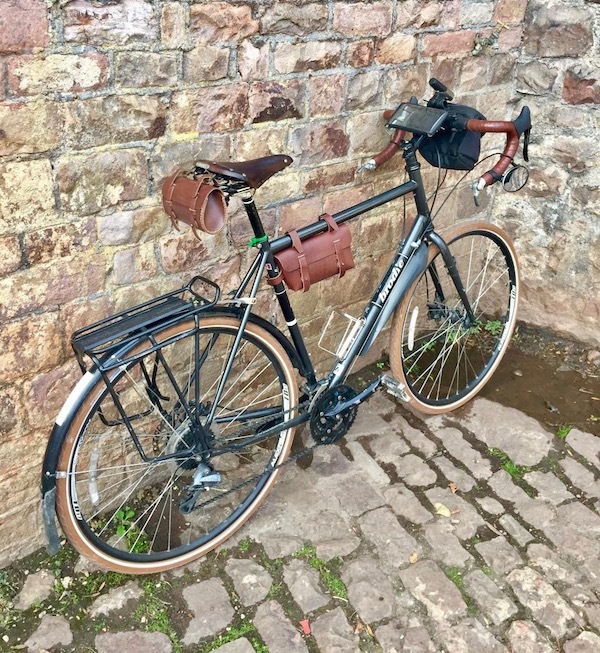 I was asked to review the Galen Leather ‘Cross Bar Bag’ and ‘Large saddle bag’ and have spent several weeks putting it to the test commuting and doing some long rides in and around the lovely city of Bristol in England. I was very keen for these bags to arrive as I had just swapped out my Schwalbe marathon tyres after 1500km + for some new funky looking Brown Schwalbe delta cruisers and thought the colours would match and look pretty sweet especially with my brooks saddle. Yes I am a bit of a sad case and like colour coordinating my bike! 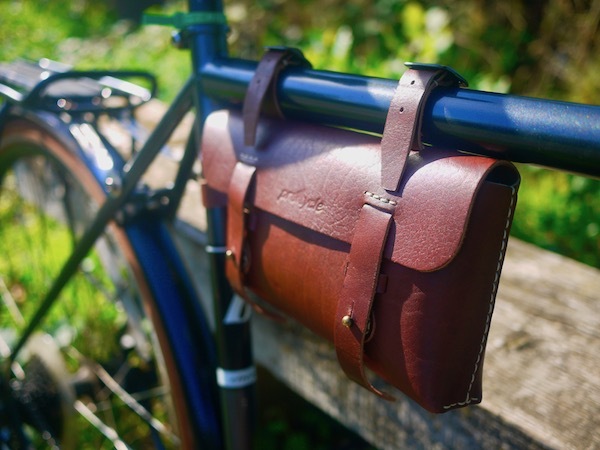 The Gallen Leather Bicycle Bags are hand stitched in Turkey, which is also a bonus to me being one of my favourite countries and a definite contender for my favourite country to cycle tour in! I was not disappointed; the bags look fantastic and completely gave my bike a cool makeover, plus the quality is superb and adds some easy to access storage space for trips around the city. 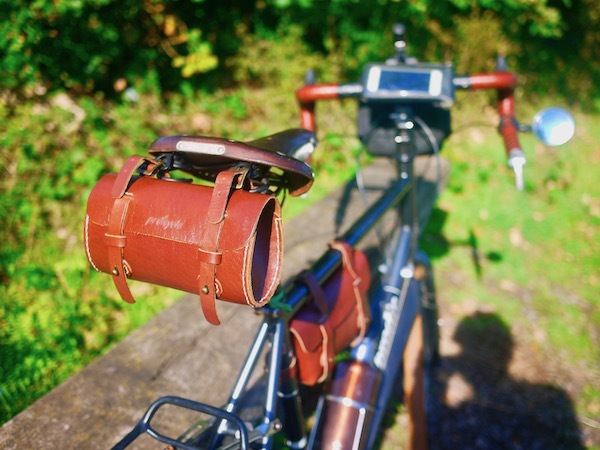 Both bags have been designed very well with the straps being long enough to wrap around a variety of tube sizes without being too long that they get in the way or rub against your legs when pedaling. The size is also ample on both the bags and can easily accommodate a spare tube, multi tool and snacks. The Cross Bar bag is also designed with one straight end and one angled end that gives it an interesting quirky look. Two straps secure the bag to the top tube with a third on the side to attach around the downtube to stop it swinging side to side too much. There’s definitely no danger of the bags opening on a ride as the straps are secured through a leather loop and a belt like button closure to keep all your goodies safe. I was very happy to discover the Saddle Bag straps lined up perfectly with the loops on my brooks saddle so attached neatly and sat just right. I can see that possibly the bag could bounce around a little if loaded with heavy items, but as it’s only a small bag and will likely be holding light items like a tube and multitool it probably wouldn’t be an issue. The most impressive part of the Galen Leather bags is definitely the quality and solid feel of them. The hand stitching is impeccable and looks like it would last a lifetime if cared for properly. 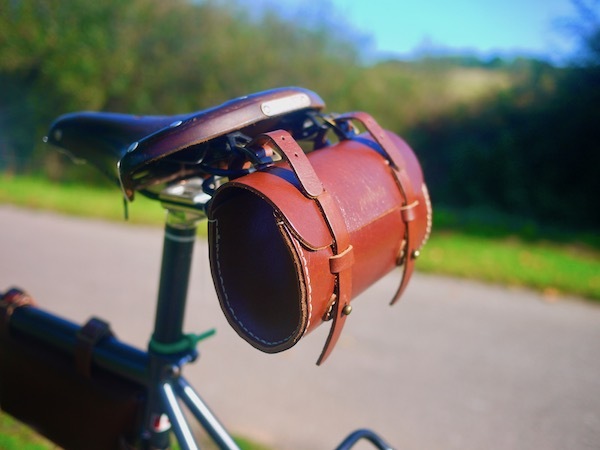 The Galen Leather Bicycle bags are also treated with natural oils and beeswax to add an extra layer of protection against the elements. Obviously only having rode with them for a couple of weeks I can’t really comment on how durable they are long term, but the leather is thick enough that I feel it would be very hard to damage these bags and they will most probably take quite a beating and come out fine. The straps are made from leather the same thickness as the bag and are wide enough that I doubt they will ever tear or the holes stretch too badly which could be a worry on a thinner strip of leather. So Far I have been very happy with the Galen bags and love the touch of class they bring to my slightly beat up touring bike. They definitely turn a few heads commuting around town, but more than just being pretty they do their job perfectly, stashing extra stuff for when I’m out and about around town but don’t necessarily want to take a pannier along for the ride. I can quite easily fit enough snacks for a solid days riding in the Galen Cross Bar bag while stuffing patches, inner tube, a multitool and my brooks seat cover in the Large saddle bag. I’ve been happy enough with the bags and am confident enough in the quality of them that I’m planning on trying them out on Kelly’s mountain bike on our next bikepacking trip as the cross bar bag should just squeeze into her small bike frame and give her some quick easy access to essentials. Beautifully crafted, eye catching and gets the job done! Enjoyed this gear review? Check out a few other gear reviews. Many of you know all about our long distance bike trip (how has it been a year since we finished?) and you’ve probably guessed from the blog name that we’re all about the two wheels. 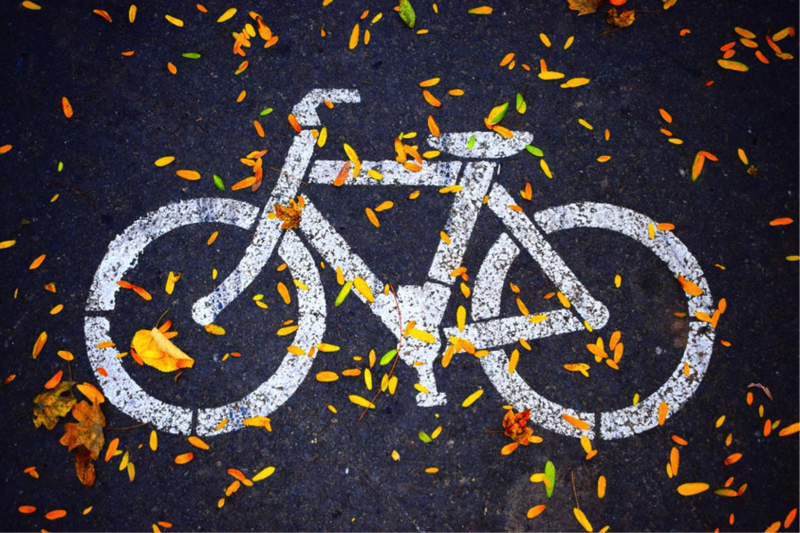 So, we think we’re pretty knowledgeable when it comes to what makes a city bike-friendly! For example, a place with accessible public transport is a bonus, so it pays to do your research before booking somewhere. A lot of places will be able to tell you if they have anything in place for those in wheelchairs, so this should give you some idea of how easy it will be to wheel your bike around. Seeing the world or a new city via bike is such a great option, as it keeps you active and reduces your carbon footprint. Here are three of the best cities to do this in. Often considered the most bike-friendly city in the world, there are around 242 miles of bike lanes around the city, as well as a Cycle Super Highway which runs from Copenhagen to Albertslund. Just like a car highway, has amenities on the route such as air pumps, as well as specialised traffic lights that are geared up to the average cycling speed. There is so much to see and do in Copenhagen, from The Little Mermaid sculpture to Tivoli Gardens theme park, and Amalienborg, the Queen’s winter residence. You will want to bike between them all to make the most of this fantastic city. I’ll be in Copenhagen in a couple of weeks, before heading off to Greenland to run the Polar Marathon. I’ll be sure to pop on a bike while I’m there, and explore the city. One of the iconic things about Amsterdam is the number of bikes that are whizzing around the city at any one time. Almost 60% of the population cycle every single day, and cyclists have a free-for-all in this city, in that they are able to ride almost anywhere. There aren’t any special infrastructures for cycling as there are in Copenhagen, so things are a little rougher and harder to keep up with if you are a novice tourist rider. However, Vondelpark is a beautiful place to cycle around and get your bearings until you feel a bit braver and want to cycle across the city. It’s true what they say, bikes in Amsterdam will stop for no one, so it’s important to be really aware of others around you, whether you’re a cyclist or a pedestrian. Another win for The Netherlands. Utrecht has been working particularly hard over the past few years as part of a project called “Utrecht Attractive and Accessible”. This flagship project boasts an incredible 12,500 bike parking facility which is the largest in the world, and by 2020 the government hopes to have doubled the capacity. Again, they are placing infrastructure specific to cyclists across the city in a bid to encourage more locals to choose a bike as their preferred form of transportation, but it’s clearly working as the numbers are soaring! There are so many cities that are good for bike-riders, but these are three of the best, worked out by the Copenhagenize Design Company index. Each city is judged on 14 different categories and they can earn between 0-4 points in each of them, as well as a bonus of up to 12 points if there is anything a city has done that is particularly impressive. 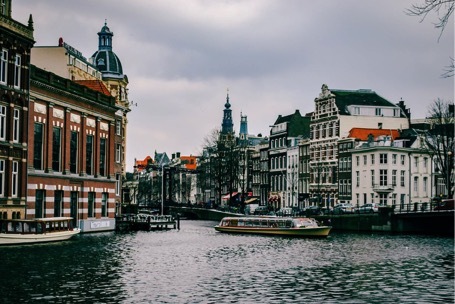 The index is updated every year which is interesting as it allows cities to see whether they have moved up or down — for example, this year Utrecht has overtaken Amsterdam for the number two spot, so Copenhagen should keep working hard to stay at the top! Have you been to any of these cities? What do you think about their bike-friendliness? Let us know in the comments. 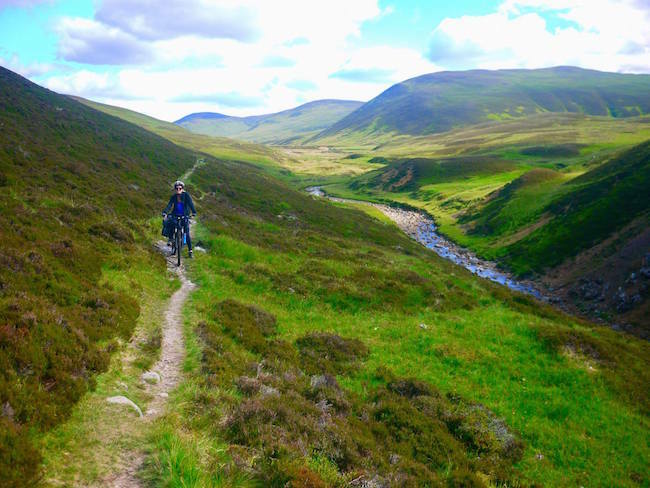 We were asked if we’d Review the Montem Sneaky Snuggler Camping blanket before we did a car camping trip around Iceland and I decided to take it along on a bikepacking trip as well around the Cairngorms national park in Scotland to really put it to the test! The idea of a blanket for camping really appeals to me as I enjoy the comfort and ease of just throwing a blanket over me instead of zipping myself in and feeling slightly trapped. 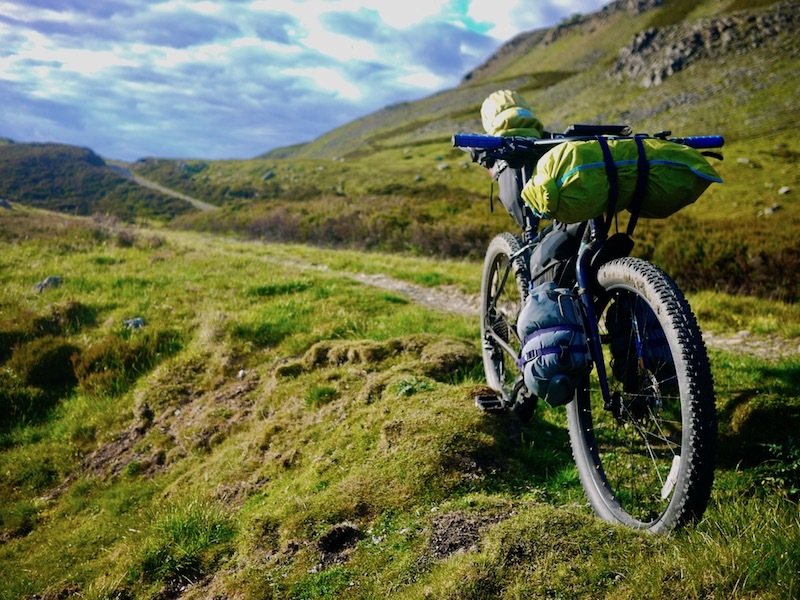 The blanket performed excellently for the car camping in very cold conditions in Iceland and even held up well to the slightly rougher and more rigorous conditions of a bikepacking trip in warmer weather. The Montem Sneaky Snuggler Camping Blanket is designed very well and feels lovely against your skin providing a bit of home comfort while camping. The stuff sack it comes with is very generously sized so it is a breeze packing it away and pulling it out once you’ve set up camp or decide on a suitable picnic spot! Car Camping in Iceland! Sneaky Snuggler kept me toasty warm even when it got chilly in iceland! 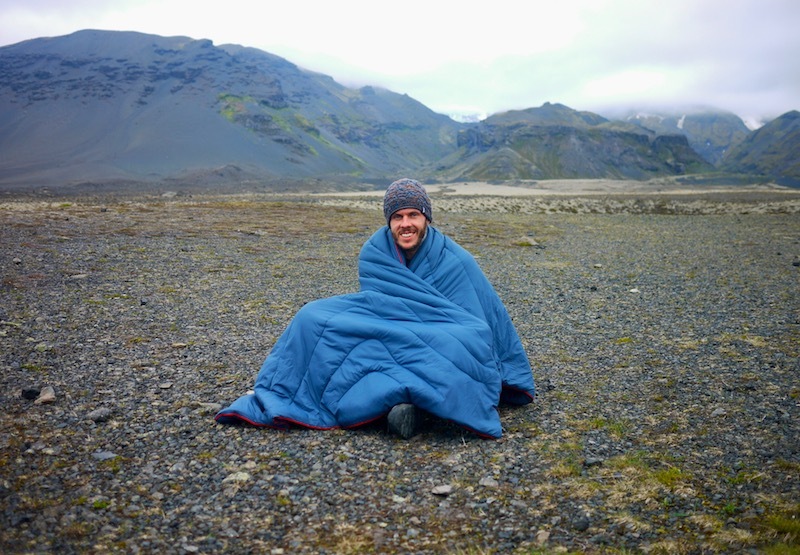 Before our trip around Iceland I was slightly sceptical about the Montem Sneaky Snuggler Blanket’s ability to keep me warm if the temperature dropped close to zero, as I had never taken just a blanket camping before. It proved itself worthy on the first night of camping with temperatures dropping close to freezing, but I remained toasty warm simply by wrapping myself up in it tightly and tucking my feet in so my body heat couldn’t escape. I loved the ease of just pulling it over the top of me when I was chilly without having to mess about with zips or zips jamming and particularly appreciated this when I needed to get up to go to the toilet in the night; much easier to get out of! 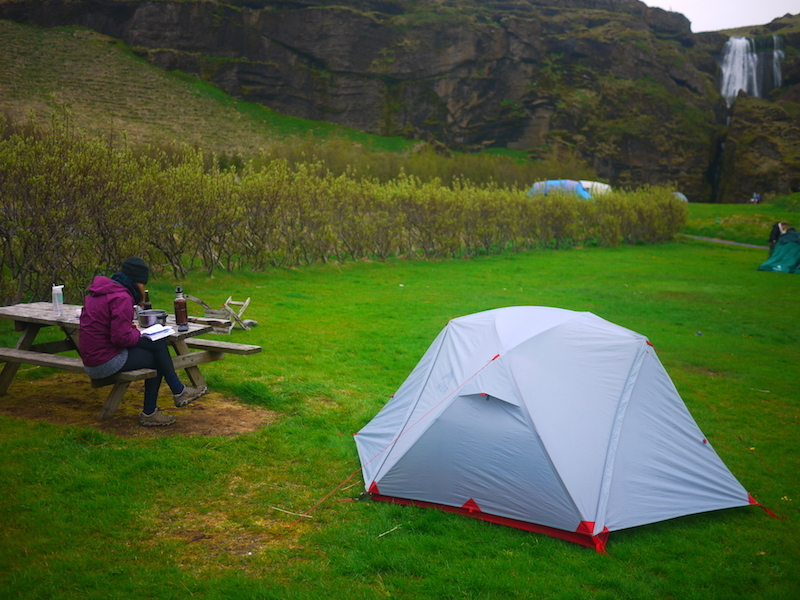 We also used it picnicking in parks across Iceland throwing it on the grass to sit on without worrying about getting too damp or dirty because of the water resistant coating, this is definitely a great feature and it makes it much more versatile than I first expected. Montem Sneaky Snuggler blanket fit perfectly on my handlebars bikepacking the Cairngorms in Scotland. Because of the generously sized stuff sack it is quite bulky when packed up, but for the bikepacking trip in Scotland I put the Montem Sneaky Snuggler Camping Blanket in a compression sack and was very pleased with how small it could be compressed down. 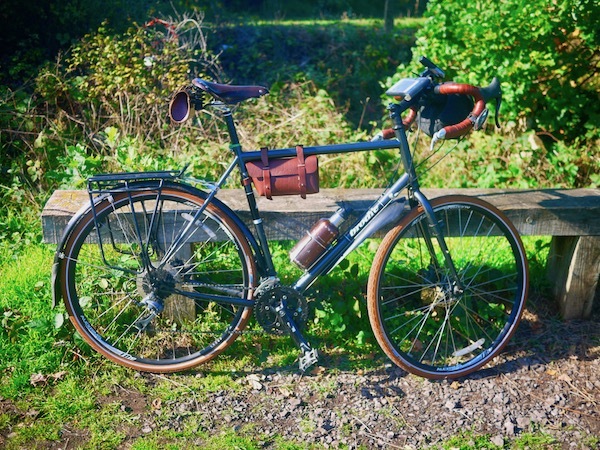 It was easily small enough to be strapped to my handlebars without being to long and interfering with brakes, perfect! It was extremely warm for Scotland when we were riding with temperatures reaching over 30 degrees Celsius, so I was very glad of having a blanket that I could easily vent myself with and kick my legs out when it was getting too warm without having to battle getting my feet out of like in a mummy style sleeping bag. After 5 nights of bikepacking and wild camping I expected the blanket to be a bit dirty, but again the coating kept it stain free! I found the Montem Sneaky Snuggler Camping Blanket to be very well made with quality stitching and the heavy-duty ripstop material feels like it will withstand any rough treatment you can throw at it, plus because it has no zips there’s not really much that can go wrong with it! The DWR water repellent coating is definitely a very good feature for this blanket to make it more versatile so it can double up as a comfy picnic blanket without having to worry too much about it getting wet or any food spills staining it as easily as other materials. Overall I have been very pleased with the Montem Sneaky snuggler camping blanket and it will now be my go to sleeping system for car camping and picnicking! For a round the world cycle trip I’m not sure it would be my first choice simply because blankets cannot compete with sleeping bags when it comes to warmth if the conditions get seriously cold as there is no way to trap the warm air in completely without zipping it around you so it wouldn’t be ideal for a trip where you could potentially run into some extreme weather. If it were a weekend away bike trip or a short journey locally then I definitely wouldn’t hesitate to bring this baby along for the ride! It was lovely being able to snuggle up in the Montem Sneaky Snuggler at night as it really does feel like having a little slice of home with you in the tent. I also love that it is so multipurpose and can be folded out and sat on for a picnic or at a concert, thrown over yours and your partners shoulders or brought along on car camping trips as an extra layer either on the floor of the tent or over the top of two people if it is a particularly cold night. You can find more of my gear reviews here! Trip notes to help anyone interested in planning a cycle trip in Canada. New Promotion: Leave us an Amazon review, then send us a screen shot to get a free pdf of our France to China book. France to China by bike charity book! All royalties from this book will go towards supporting the global sanitation and World Toilet Day campaigns. If you've enjoyed our site, you can show your support by buying us a coffee. Coffees help fuel us through our cycle trip, esp on those cold, frosty days - the extra juice is appreciated!